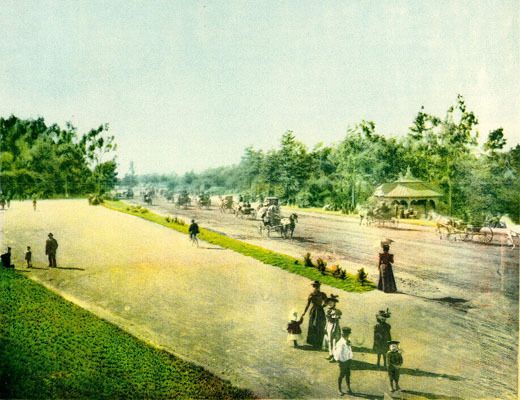 ← who really designed golden gate park? The definition of “wildlife” in urban parks is far from precise! Here’s an excerpt from a story by Matt Smith from SF Weekly that illustrates evolving urban ecology and some of the dilemmas that attend this evolution. “It’s 7 o’clock on a dewy Friday morning as Paula Kotakis pushes through the brush just west of the de Young Museum in Golden Gate Park. She’s wearing a green nylon jacket, slacks, and muddied black athletic shoes — her cat-hunting outfit. As she rattles a scoop of kibble, out ambles Gigi, a fat gray feline who inhabits the thickets nearby. “Gigi’s pretty butch,” Kotakis offers by way of introduction. Sure enough, a brown-and-white-banded rodent creeps along the side of the box. Gigi crouches, then feigns a lunge toward the rat, which retreats strategically into the box and behind the food bowl. Gigi stalks away 10 steps, then stops, turns, and glares back at her food. This underbrush encounter unfolds with surprising naturalism, as if these feral animals barely notice Kotakis. She might as well have melted into the landscape: She has come to this spot so frequently, for so many years, that these urban creatures seem unafraid around her. . . .
Kotakis is not alone in her dedication. 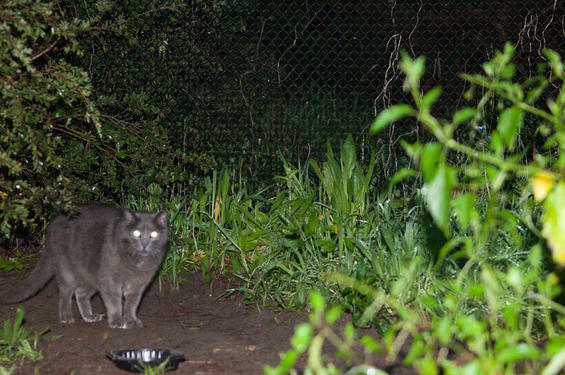 She is one of more than 100 self-described cat caregivers in San Francisco who prowl the city’s underbrush each morning and night to refill hidden cat dishes. They see themselves as a vital force against an alternative they consider unconscionable: having feral cats, either abandoned or born into the wild (and thus, unsociable and unsuitable for adoption) killed at animal shelters. The feral cat advocates (Kotakis calls herself and her friends “feral people”) say their real objective is to reduce the city’s population of feral cats by trapping and spaying as many as they can, then letting the neutered animals live out their lives in well-fed, outdoor comfort. This, they argue, is the most humane and effective way to reduce feral populations. 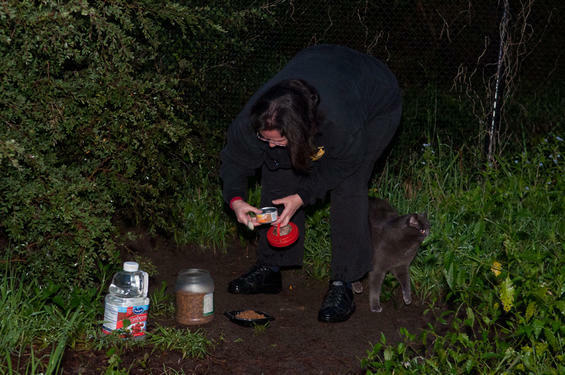 This approach — trap, neuter, release, or TNR — is San Francisco’s primary method of dealing with stray cats. . . .
During the past decade, cat ladies like Kotakis, all but invisible as they do their feeding rounds in urban but wildlands, have evolved into a powerful national force. Led by Alley Cat Allies, a Washington, D.C.-area nonprofit with a $5 million annual budget, some 200 charities oriented to help feral cats strive to convince local, regional, and national government agencies to adopt TNR as an alternative to killing cats in shelters. “Dozens of cities and municipalities across the country have embraced TNR as official feral cat policy — and the momentum is building,” Alley Cat Allies communications manager Elizabeth Parowski says. The San Francisco SPCA adopted TNR as its official feral cat policy in 1993. . . . But people outside the world of cat lovers aren’t pleased with this version of success. Environmentalists and natural preservationists condemn the feral feeding movement as deeply misguided. They charge that returning feral cats to the wild and feeding them merely sustains the cats, which are efficient bird killers and disease spreaders. Other critics say that it’s impossible to care for all outdoor cats, explaining that feral cats are sickened by bad weather, run over by cars, killed by coyotes, or simply starved because feeders weren’t able to attend to a cat colony for the several years or more that are called for. As a result, the animals are left to suffer and die in pain. . . .
Environmentalists point out that outdoor cats are a greater problem to the natural ecological balance than most people realize. In urban and suburban areas, outdoor cats are the No. 1 killer of birds, by a long shot, according to a new study in the Journal of Ornithology. Researchers from the Smithsonian Institution put radio transmitters on young catbirds and found that 79 percent of deaths were caused by predators, nearly half of which were cats. via S.F. Feral Cats Policy Good for Cats, Terrible for Birds – Page 1 – News – San Francisco – SF Weekly. This entry was posted in people, urban ecology, wildlife and tagged feral cats, golden gate park, urban parks, urban wildlife. Bookmark the permalink. This is so interesting… quite the dilemma… it’s sweet that the “feral people” tend to the cats… but a great point that the feral cats are detrimental to other species, especially the birds that the park is trying to protect! Birds are a big part of the soul of nature and so important to the ambiance of a park because they bring the action, music and beauty. Love the blog Professor or Heath ;). Regarding the recent article in SF Weekly, there’s much more to the story that writer Matt Smith suggests. I’d like to clarify a few points, then, beginning with the number of outdoor cats suggested in this article. That 150 million figure is one that the American Bird Conservancy (ABC) has been promoting for the past year or so. It’s flawed in two ways. First, the estimate for feral cats is a wild guess, with no basis in science at all. Then, the number of free-roaming pet cats is inflated, ignoring the results of multiple surveys of pet owners. This, I’m afraid, is another example of ABC (on whose board Jonathan Franzen sits) putting marketing ahead of science. Even if the Smithsonian’s Pete Marra and his colleagues are correct about the three additional kills, the title of “primary predators of young catbirds” goes not to the cats, but to the “unknown predators” (with 14 kills). Seven kills were attributed to rats or chipmunks. But again, this is about headlines, not science. Travis Longcore’s paper in Conservation Biology was not a study, but a review of the literature—and a very selective one. (For a comprehensive critique, please visit Vox Felina.) Among the important work he conveniently ignores are the studies showing that birds caught by cats are, on average, not as healthy as those killed by collisions with buildings, cars, and the like. Not that this is news; this, after all, is typical of prey-predator interactions. Longcore, ABC, and other TNR opponents like to throw around predation estimates, but fail to acknowledge just how flimsy they are. These figures can typically be traced to small—often flawed—studies, the results of which are subsequently extrapolated from one habitat to another, conflating island populations (where the presence of cats can have dire consequences) and those on continents, combining common and rare bird species, and so forth. In the end, such “estimates” of annual predation rates are utterly meaningless—useful only as a sensational talking point “sold” to a mainstream media and public generally unfamiliar with the larger context. And so, the shameless witch hunt continues. Moreover, real-world experience suggests that we can’t kill our way out of the “feral cat problem,” even if we wanted to. Consider what was done on Marion Island, for example, where—despite being only 115-square-miles in size, barren, and uninhabited—it took 19 years to eradicate something like 2,200 cats. Using disease (feline distemper), poisoning, intensive hunting and trapping, and dogs. The cost, I’m sure, was astronomical. TNR is not ideal solution, but in many situations, it’s the best option we’ve got. Our post also analyzes other aspects of the Nebraska study, including the qualifications of its authors. We conclude that the study is not based on science, but is rather a rhetorical tool used to justify the killing of cats. We hesitated to post this comment at first because we actually do not approve of the feeding of feral cats in public parks. Although we support TNR, we do not believe that a balance can be achieved in the competing interests of all animal residents in the park if the feral cats are “subsidized” by well-meaning people. I had a look at the Smithsonian study, which was interesting… but said a lot less than has been publicized. Of 69 catbirds tagged, the majority, 42, died. Of these, only 6 were definitely taken by cats, and an additional 3 may have been. At these small sample sizes, statistical analysis tends to lose its validity. Even if we accept it, it doesn’t indicate (as it would seem to imply) that eliminating feral and outdoor cats would greatly improve song-bird survival. Had there been no cats in Maryland (where the three study sites were located), the birds had less than 50% chance of surviving the other dangers such as other predators, glass panes, and disease. So maybe 3 or 4 additional catbirds would have survived. Maybe. If the cats were actually taking the most vulnerable birds (slower, louder, less wary) then perhaps no additional birds would have survived. The SF Weekly, which recently did an excellent article about the use of a poorly-designed study purporting to show rapidly rises in juvenile prostitution, seems to have uncritically accepted this one.